olds ~ aeon genesis ~ We got the tools, we got the talent! # Posted on April 25th, 2013 04:20 PM by Gideon ZhiJust dropping a quick word about Royal Stone´s recent dramatic progress. In the last few weeks TheMajinZenki, who you might know as the translator for the recent JoJo´s patch, has been tearing through the game´s script. All of the text unrelated to the actual progression of the story has been inserted, though admittedly only about 90% of it works correctly at the moment. He´s also translated roughly the first two thirds of the main story dialog; I´ve edited and inserted about half of that. I´ve also done a huge pile of work on the technical aspects of the project, including cracking the compression the game uses for its introduction and its combat menus, as well as the sprite data it uses for pause menus. The game is currently playable with only minor issues through Round 5, and all this in the space of a couple of weeks! I´ve taken 24 screenshots, some of which you may recognize but most of which are new. With a little luck I should have more news for you soon! # Posted on April 13th, 2013 10:24 PM by Gideon ZhiA week late, admittedly. Sorry about that, but school kind of got in the way, and a few nasty unexpected issues crept up during the playtest. It should be all fixed now, though! For the uninitiated, this is an RPG based on Stardust Crusaders (no relation), the third arc of JoJo´s Bizarre Adventure. It´s a reasonably okay game, not great but not bad either. If you´re a fan of the source material, you´ll probably get the most appreciation out of it. Enjoy! # Posted on November 9th, 2012 03:32 PM by Gideon ZhiJust dropping a quick head´s up here that SMT if...´s text translation is done. Its hacking currently looks identical to SMT2´s, but with added main dialog proportional font. I´d LIKE to clean up the hacking a bit though, and the majority of the text isn´t inserted yet - in fact, I still don´t actually have it. It´s still on Ian´s computer, and he unfortunately got smacked pretty badly by Hurricane Sandy and is currently mostly without internet access. Still no ETA. # Posted on October 25th, 2012 07:14 AM by Gideon ZhiJoJo´s Bizarre Adventure for the SNES. Spent a couple of days getting it to this point. Extraordinarily basic stuff, real easy to hack. It can be nice to have your way with something simple for a change. # Posted on April 14th, 2012 11:21 AM by Gideon ZhiSo I´m sure the big burning question on most peoples´ minds is, "What took you so long?" The short version is that while most of Shin Megami Tensei: if... (hereafter SMTif) is technically identical to SMT2, one crucial part of the game is different: font storage. While SMT2 stores its font right out in the open, SMTif´s is compressed. This by itself would not normally be a problem, but instead of unpacking the entire thing to RAM like some games do, SMTif unpacks individual letters - making my usual workaround for these sorts of things largely ineffective. I´ve had project files (including a complete script dump) for if sitting on my hard drive since 2008, but it wasn´t until May of last year that we got the font stuff fully sorted out, thanks to veteran romhacker Neil_ who you may know from the Partial Translations version of Dragon Quest 5, among other things! So not only has it been a long and arduous process getting it even this far, it´s been an interesting job keeping quiet about it :) I initially wanted to announce work on this much sooner, but didn´t have anything to show for it until recently. Ian Kelley returns to do the script, so stylistically it´ll be similar to SMT 1 and 2. We´re largely adopting official naming conventions for spells, items, demon races, etc when available. There are a few notable deviations (we´re considering Fey or Fae for the yosei race due to its largely celtic membership, as opposed to Fairy) but by and large we´re conforming. 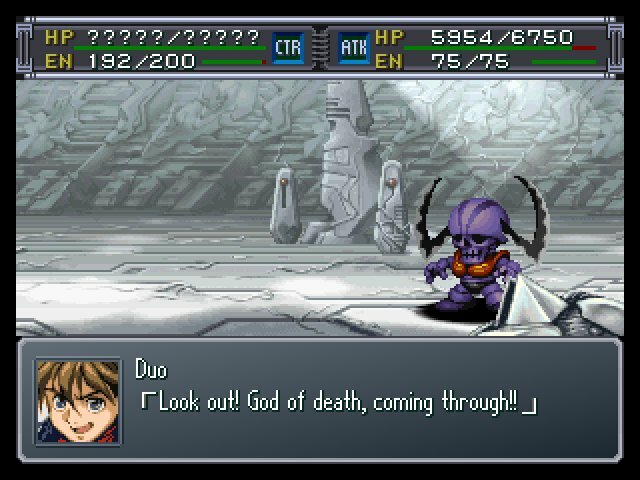 I also elected to go with a fully proportional font for this one; compare the screenshots below to SMT2 to see the difference. There are a few other technical improvements I´d like to look into, such as expanded item and equipment names in subscreens, that´s going to come after I´m done with the rest of it. So don´t expect this immediately, or possibly even soon. It´s a process, and it´s not nearly done yet. But I´m hoping that despite SMTif´s distant ETA, this announcement will make a lot of people happy. # Posted on April 14th, 2012 10:29 AM by Gideon ZhiThis has been in the works for a pretty long time; a quick check reveals an early alpha version dating back to January ´08, but it´s come a long way since. Really fun stuff! The script, though small, needs editing, and there´s an awful lot of graphics to replace. The screenshots both below and on the project page show current progress on that front, which if I do say so myself looks really, really good. There isn´t really too much else to say about this except that it´ll be done when it´s done, which is a function both of time constraints and motivation/exhaustion. Announcement ~ This incident?# Posted on April 7th, 2012 12:37 PM by Gideon ZhiIt´s because of plasma. # Posted on April 3rd, 2012 11:39 AM by Gideon ZhiQuick note, thanks to veteran translator _Bnu (who some of you may know!) 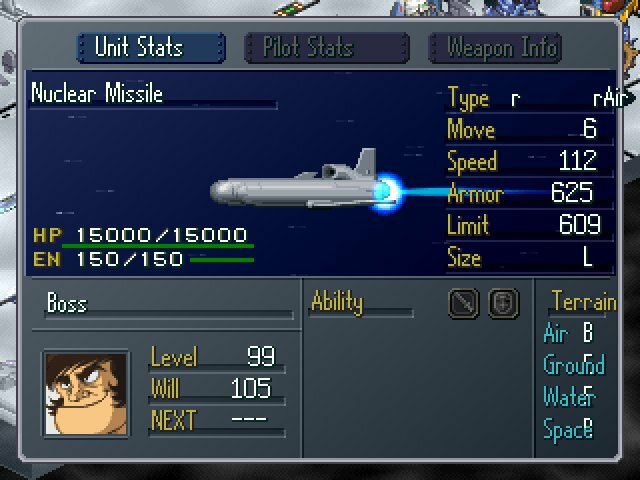 SRW Alpha´s animated battle sequence dialog has been fully translated. The big remaining untranslated pieces at this point are the robot and character encyclopedias, which are about 200K apiece. Antialias is still plugging away at the main dialog, and is probably about 1/3 of the way through it. Alpha has an ungodly amount of text though, so it´ll still probably take a good long while. Secondly, regarding PAX East - this is the last reminder I´ll be posting before the event. But I actually have some details this time! We´re going to be showing off current SRW Alpha progress as well as an SRW Alpha Gaiden gag reel save. We´re also going to be showing off current prototype work on a long-dormant project, an unannounced SNES puzzle game, and an unannounced SNES RPG which a lot of you have been asking about for quite a few years. Excellen (who you´ll know as Alpha Gaiden´s translator) will be there, as will Niahak (another translator) and MathOnNapkins (Zelda 3 editor author.) Niahak will be showing of a Suikogaiden translation as well as a new version of JESUS: Tale of the Dreadful Biomonster. This is going to be happening at 11AM on Saturday in the Classic Console Freeplay Room for (roughly) an hour and a half, so if you´re in the area, feel free to stop in and say hello! All games will be running on their original hardware, and I should have playable versions of many released hacks and translations, as well as a few playable versions of unreleased stuff. Rejoice and Ladystalker, anyone? Miscellaneous ~ Plasma# Posted on March 17th, 2012 10:14 PM by Gideon ZhiOh, this incident? It´s because of plasma. Plasma explains everything. But we can´t be sure so you shouldn´t go outside. There´s no scientific basis for believing it´s safe out there. To learn more about plasma, come find me during PAX East and watch this space during the weekend of April 6-8 where we will be announcing two major projects, showing off new work on other projects, and maybe even releasing a patch for a game I haven´t even looked at since 2004! Our presentation at the show will include live actual-hardware demos of translations, and maybe even an actual-hardware gag reel demo of SRW Alpha Gaiden if we´re super super lucky! # Posted on February 19th, 2012 10:33 AM by Gideon ZhiJust as the title says, Blue Sphere´s main script has been translated. Doesn´t include cutscenes, encyclopedia entries, list files, etc though. Haven´t mucked about with it much since, but I´m trying to strike a deal with evo of the Italian project for VWF code. Unfortunately, I don´t have any screenshots or anything to show just yet, but the news is big enough that I figure people would want to know.